T304 Stainless Full 3” with a custom flange that allows the factory cat pipe to bolt up to the exhaust system without having to neck down. 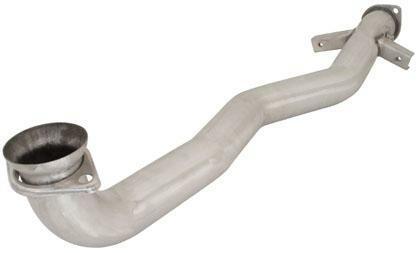 Made from heavy gauge 4” inside diameter 304 stainless steel, the Turbo XS Downpipe is larger than any other WRX/STi Downpipe on the market. Why is that important? Because, despite what your girlfriend might tell you, size does matter. Turbochargers work best when there is large pressure and temperature differential across the turbine wheel. Having a large, free flowing downpipe is what give you that large pressure and temperature differential. The downpipe tapers to 3” towards the tail and even includes a pre-welded 02 sensor bung for installing an aftermarket wideband O2 sensors. OEM style doughnut gasket enhances flexibility, durability and sealing as opposed to lower quality flex joints.